At the 116th Annual Meeting in June, the Asheville Area Chamber of Commerce honored outstanding companies and individuals. Over the next few weeks we will highlight the eight award winners. 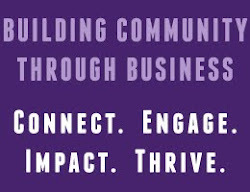 The Asheville Chamber's Good Health Good Business Award, sponsored by Mission Health, recognizes a business that demonstrates service and exceptional leadership which have resulted in improving the health of the Asheville community. YWCA of Asheville received the 2013 Good Health Good Business Award for their exceptional work with the Diabetes Wellness & Prevention Program. The program aims to empower individuals with diabetes to develop the habit of exercise, reduce the incidence of diabetes, through weight loss and exercise and promote healthy lifestyle changes for the entire family. "By working out together and supporting each other, participants create an environment of acceptance and friendship," said Beth Maczka, Executive Director of the YWCA of Asheville. On the day in May when the Asheville Chamber stopped by with Amplified Media to film for the award video, a group of women were working out with a trainer in the gym. It was clear to see the positive impact of that support network and the rapport these participants had with their trainer and each other.